Aptalon™ W8062 by Lubrizol is a waterborne 1K self-crosslinking polyurethane dispersion designed using patented polyamide polyol technology. It provides excellent resistance to hydrolysis, chemicals, and abrasion while still imparting superior hardness. This makes the polymer suitable for high-performance wood flooring applications, as it exhibits excellent wear in high traffic areas and on sports floors. 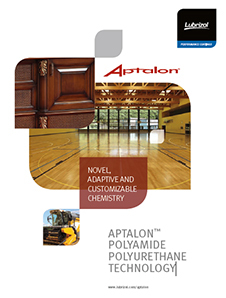 Aptalon™ W8062 meets the performance properties of many solvent-borne finishes while being able to be formulated at a significantly lower VOC. The grade is NMP-, NEP- and APEO-free and meets US & EU VOC regulations. It has an excellent gloss retention leading to longer service life. The recommended re-test date for Aptalon™ W 8062 is 360 days after date of manufacturing.